There are several fun elements that you can incorporate into your winter wedding tablescape to make it memorable and reflect your unique style. Below I've listed a few of my ideas of winter wedding tablescapes for you to explore. Any suggestions? Feel free to let me know! You can make your tablescape a collection of bright greenery (like fern or pine) or a darker, moodier setting with succulents and eucalyptus. Adding antlers or leaves also had some interest. 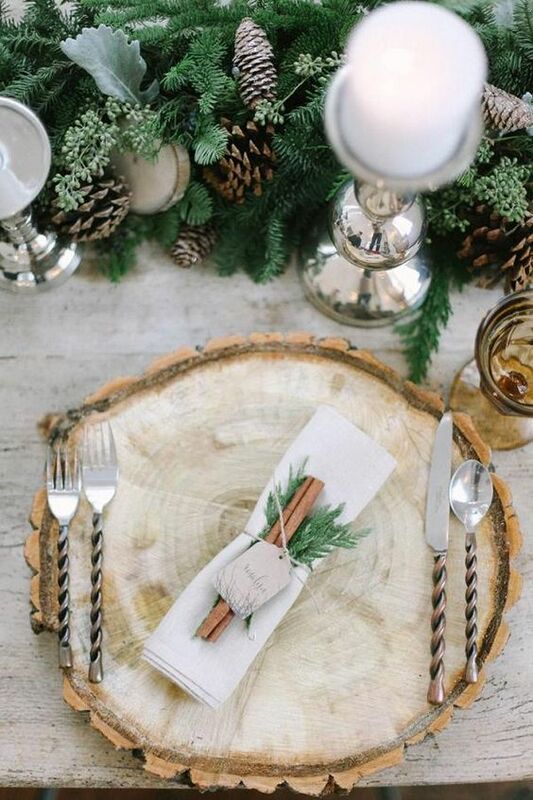 Incorporating wood elements into your tablescape is a great way to create a rustic tone for your wedding. You can use slices of wood as table mats or centerpieces. Going for a classic, sophisticated look? Mixing patterns such as tartan and blue china create an interesting contrast. You also can use fruits such as pomegranates or berries to add texture. Because who really doesn't love at least some gold accents on a winter tablescape? Whether you'd like something light and airy or something with more contrast, you can look to silverware or glassware to add gold accents. Sarah's here to help you create your perfect tablescape! Thank you! Sarah will be in touch with you ASAP!